This completely remodeled unit has an unbeatable location. Out the back door is a golf course in summer and a cross country ski course in winter with unsurpassed mountain / golf course views. A shopping center is one block away with 24-hr. supermarket, drug store, restaurants, cinemas... The free shuttle is even closer - at the complex entrance. The unit was remodeled in 2017-18 with a totally new kitchen, all new baths and all new flooring. Counter-tops are quartz in the kitchen and granite in the bathrooms. Appliances include an all new GE Adora stainless steel 3-rack dishwasher, a GE flat top range with convection & EZ clean oven, a deluxe M/W featuring sensor cooking and an LG French Door Frig with ice-maker. The furnace was replaced in 2018 and includes a built-in humidifier that can be controlled by an iphone. When not golfing, skiing, fishing... relax in the spacious living room with 20' high ceilings, large fireplace, a 55" Samsung Smart LED HDTV, over 150 HD channels and a DVR to record programs (that can be viewed on any of unit's three TV's), Blu-ray DVD and Sony home theater. The unit has a covered carport directly in front of the entrance, its own W/D, high speed Internet, WiFi, the ability to listen to your iPhone/iPod/iPad music with the stereo in the living room and or with Soundbars in both bedrooms, with dozens of music channels, libraries (movies-music-books-games), living room ceiling fan with remote and a wall safe. The patio also has a Gas Grill and outdoor furniture with fabulous mountain views. The flooring is all new consisting of carpet in the living area and bedrooms, porcelain tiles in the baths and a rustic vinyl flooring with rigid core in the kitchen, dining and hall areas that's durable and easy to clean. The furniture consists of rustic pine furniture and oversized living room furniture. Each bedroom has a private bath, new Beautyrest mattresses, TV with soundbar and dual alarms. The Master Bedroom has both queen and twin beds with a 50" HDTV and a desk area with office chair and All-in-One Laser. The other bedroom has a king bed with adjustable frame, a 42" HDTV. A queen sleeper sofa downstairs is close to the half bath. Deluxe bedding includes high count all cotton sheets with hyper allergenic pillows. Enjoy the complex amenities just a couple buildings away! All guests have unlimited access to the heated pool, two large hot tubs, saunas, clubhouse, office with concierge and tennis court. Situated directly on the golf course, this townhouse is extremely desirable in both the summer and winter. It's directly on the White Pine 10 km cross-country ski course, only 1-block from the Park City Golf Club Pro Shop and range and there are also about 6 other golf courses within 30-minutes. Fabulous fly-fishing is also nearby on the Provo river. Jogging, hiking and bike and trails begin at or near the complex and extend for miles. There's also no better location to be on July 4th for cooking out on the patio grill and viewing the spectacular Park City Fireworks. While many people drive hours to view these fireworks, you'll be able to see them from the patio and enjoy all the comforts of home! This town-home is within a three-mile radius of three World Class ski areas: Deer Valley, Park City and The Canyons. Other major ski areas, such as Alta, Snowbird, Brighton and Solitude, Sundance - are within about 30 miles as is the Salt Lake Airport, providing our guests with many options. 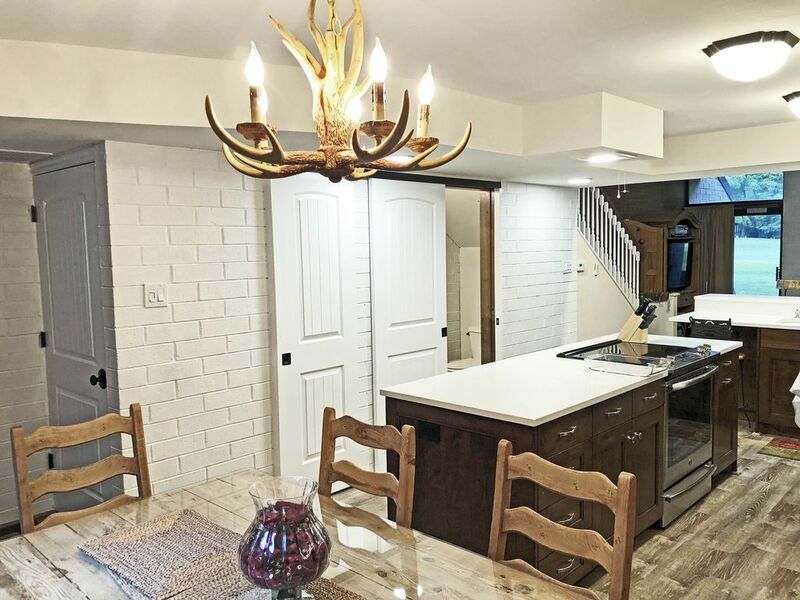 Keywords: Condominium, Townhouse, Utah, Utah Condo, Park City Condo, Park City, Golf Course Condo, Park City, Golf Townhouse, Ski Condo, Ski Course, HDTV, fireplace, DVR, Ski-in, Ski-out, On Golf Course, Mountain Views. After growing up in the Midwest, I've lived in Atlanta, Chicago, Denver, New York and Los Angeles. After working for major corporations, it was time for me to spend more time with my passions of golf, skiing and tennis. Having traveled to over a couple of dozen ski resorts around the world, I decided to purchase a a townhouse that provide great access for sporting interests, and much more. Often I was disappointed in my accommodations during my travels, and occasionally use this townhouse myself. I've improved it with many more features and comforts than you'll typically find in rental units. You're invited to enjoy the comforts of my units and the many activities that are so close that some, like skiing and golf, are literally just out the back door. This unit has an unsurpased location. Out the back door is golf and nordic skiing. One half block away is the free shuttle, one block away is shopping/restaurants and 1/2 mile away is the resort and historic district. It's also completely remodeled in like new condition. toilet, combination tub/shower, Also included is a vanity cabinet with sink & mirror. toilet, combination tub/shower, Also included is vanity cabinet with sink & mirror. toilet, Also included is vanity cabinet with sink and mirror. Park City Mt. Resort just 1/2 mile away. Walk or take the 3rd stop off the free shuttle. Situated on the 18th Fairway about 300 yards from tee; 200 yards from the pro shop and driving range. Gorgeous views of tree lined fairways with mountains in background. Views of mountains and ski slopes. On groomed 10 KM White Pine Cross Country Course. New Gas High Efficiency 2-stage Furnace with humidifier. The thermostat is an Ecobee4 with 2nd floor bedroom sensor. This allows auto reduction in temperatures for sleeping. iPhone controllable. High thread count sheets are included. A Maytag is located in a first floor closet. Located in a first floor closet. Remote controlled Gas Fireplace with Rasmussen Logs. Covered Parking in front of unit plus added parking in drive and in complex. A covered carport is in front of the unit and behind it on a private driveway is an uncovered space for another car. So, there are two dedicated parking spaces for the unit, and also pad parking. Bath, hand towels and wash cloths are provided, with extra towels in the vanities. The Modem with wireless router provided by Comcast is located in the center of the unit providing excellent high-speed reception to all rooms. Includes a large fireplace and high lofted ceilings, up to 20 feet high. The slide-in electric GE stainless steel range/over has a smooth top surface and five elements including one that is PowerBoil for rapid heat, and stainless steel knobs. 12-cup programmable in stainless steel. Oster stainless steel toaster oven with turbo convection heating. (Model TSSTTVDFL2) Also, a 4-slice toaster. Spices and seasonings are included. Included is "Roaming Elk" dishware for 8, showing an elk and mountains, approved by Better Housekeeping. (Please see one of the photos displaying a set.) Stainless steel flatware is also provided. Fully equipped with new custom made Alder cabinets that have self closing drawers and pull out shelves for the lower cabinets. The dining room table seats 6. There is also seating for four ant the kitchen counter. The main television is a 55" Samsung Smart LED HDTV. The bedrooms have 50" and 42" LED TV's. There is a Comcast 1X1 box with DVR, all TV's can share recordings & all remotes have voice control. Comcast Cable with over 100 High Def Channels. Sony 5.1 Channel Home Theater Stereo. The Smart TV can access Pandora and Spotify that can be played on the living room stereo. The Cable Service (Comcast) has a couple dozen music channels playable on any TV and also on the stereo. Included are over a dozen DVDs; some Blu-rays. There is a private atrium that allows for some limited gardening. The grounds have large grass lawns and many mature trees. Can be stored in atrium or rented at the end of the complex. A patio is in the back of the unit accessible by a sliding glass door, providing great mountain views. Cross Country ski course out the back. A tennis court a few buildings away can be reserved with the concierge. The public Park City Golf Club course is out the back door. Separate Male and Female Saunas.